We just finished our Spearheading Donations contest! 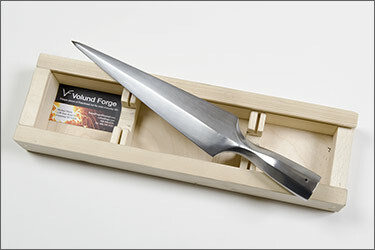 This contest has a great prize donated by Jean Thibodeau: a Custom Spearhead from Michael Pikula of Volund Forge! The contest winner has been chosen! Daniel Sullivan wins the spearhead! Take a second and give your congratulations to the winner! I want to take a moment to remind everybody that this prize was graciously donated by Jean Thibodeau who also initated the donation drive this year. Congratulations Daniel, as the owner of one of Michael's spears I will say that you will be very impressed with it. Congratulations on winning an awesome spearhead! Congratulations Daniel and let us know what you think of the spear head when you get it. I could " gush " again about how great it is but then I just finished a long series of post " bumpings " where I talked everybody's ears off about donating and how nice this spear head is. Congrats Daniel! I'm sure you'll love the spear, Michael does fine work. Congrats man. That's a fine looking spear you got there. Congratulations on the spear, Daniel! Just kidding. Enjoy your price. Thanks to all who helped in keeping this great community alive. And he just keeps going, even if its realy subtle. Congratulations Daniel, hope you put that nice spearhead on a shaft and show us a nice looking spear. Really surprised and extremely pleased to win such an item. The work appears to be so clean and crisp , beautifully simple, and the photos probably don't do it justice. Pretty excited and very anxious to see the spear "in person" and have my white gloves at the ready. Jean, I really appreciate your generosity and promise to be a good custodian!.
" myArmoury " would be likely to appreciate it's quality ). I won't say that giving is better than receiving but it's at least as good. Congratulations, Daniel. Looks like a really nice spear, I hope you enjoy it! The work appears to be so clean and crisp , beautifully simple. Michael lines are very clean. I like very much. The spear arrived yesterday. The photos give only a slight hint as to what it like "in the flesh." The beautiful flawless satin finish is really accented by the faceted surfaces. 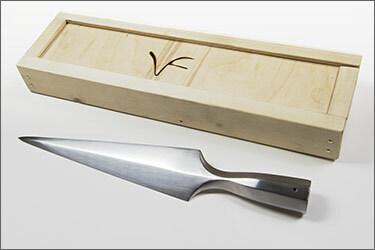 The piece measures 13.5'' X 2.25" and looks like it would be light, but it is very hefty. Have already discarded the idea of mounting it on a shaft; just couldn't do it justice. Michael, my compliment to you for a very good product. And again, thanks to Jean for his generosity. Well, very glad you like it and I did keep on and on and on repeating how nice mine is and even better than the excellent spear head it looks to be in the pics. Daniel: I agree that it's nice enough that mounting it and doing it justice may be challenging, but you could mount it semi permanently by just fitting it tightly as a pressure fit is almost good enough without adding any adhesive if the fit is precise. A small nail on each side added for safety that could be removed easily ( Or tiny screws maybe ? Not historical but this way you could mount it and get the feel of it as a using spear but take the head off and display it in it's nice box most of the time ). Guess I just did it again.